The Flower Chain quilt brightens a room like a fresh coat of paint. Easy-to-applique petals create a delightfully modern pattern that evokes sweet summer sunshine, and lazing in a field of your favorite flowers. 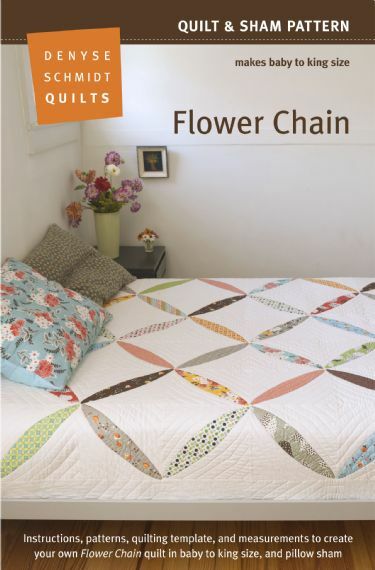 Create your own Flower Chain quilt as shown with the vintage-modern charm of Denyse's fabrics. Fat eighths of 24 different prints and solids will make up to a king size quilt. All DSQ quilt patterns include instructions, patterns, quilting template and measurements for baby to king size. Order the paper pattern with the yellow button! $15.95 plus shipping.